The brand spanking new Jaguar XF Saloon is another example of how the good times are back at Jaguar HQ. And the brand that’s hardwired to produce powerful, electrifying, classy cars wants you to be part of their modern resurgence. The XF has dispensed with Jaguar’s traditional design language, pulling it into the 21st century with fastback aesthetics. It’s spacious, awesome to drive, and looks amazing. It’s a killer four-door that’s also affordable to run (70mpg, anyone? ), and will satisfy even the keenest of drivers. OSV takes a closer look at what it’s all about with our 2017 Jaguar XF Saloon review. The new Jaguar XF Saloon is all about having as much fun as possible. It’s pure helter-skelter, and comes with almost as much handling prowess as a BMW. However, the edge is taken off performance slightly by a series of diesel engines that are more focused on affordable running costs. These diesels are 2.0-litre units that can be paired up with either a 6-speed manual or 8-speed automatic ‘box. You can get them with either 161, 178 or 247bhp. The 178bhp is our top pick. It can do 0-62 in 7.5 seconds when paired up with the manual, though the 161bhp will satisfy most of your needs. It takes 8.2 seconds to cover the 0-62 dash, which is respectable. There is also the option of a meatier 3.0-litre diesel engine that’s crisper and more direct. Its V6 powerplant delivers as much as 296bhp, and it can do 0-62 in just 5.8 seconds. However, it’s older than the other diesels, and doesn’t benefit from the same cutting-edge technology. As a result, it will cost more to run. It’s got bags of performance, though, and makes overtaking easy. There are also a few petrol engines to consider before you make up your mind. A pair of 2.0-litre engines is available in either 197 or 246bhp, with the 197 variant doing 0-62 in 7.5 seconds. The 246bhp variant covers the same sprint in just 6.2 seconds, and can be specified with four-wheel-drive. A phenomenal 3.0-litre V6 petrol engine rounds off the range. It’s shared with the Jaguar F-Type, and blasts its way from rest to 62mph in 5.1 seconds. It sounds marvellous, but will cost a small fortune to run. Jaguar has always had high standards when it comes to their interiors, and they’ve maintained them here. The cabin is sleekly designed, great to look at, and boasts some neat advanced tech. If you’ve ever had the pleasure to sit in either the XJ or XE already, you’ll be familiar with what’s on offer. The dash continues to be the show-stealer. It comes with an 8” touchscreen infotainment system, rotating air vents, and a rotary gear selector knob. All cool stuff, although you can add an even bigger 10.2” touchscreen if you prefer. It comes with smartphone connectivity, and lots of personalisation options. It also lets you pay at Shell stations for your fuel wirelessly. You don’t even need to leave your XF to do it! 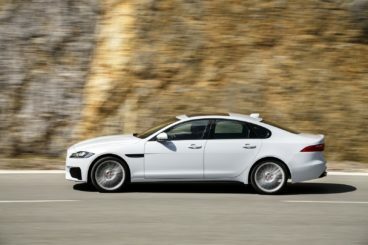 Despite offering lots of performance, the XF Saloon hasn’t forgotten its duties to be practical. The 540-litre boot is one of the biggest in its class, making this one of the most usable exec saloons money can buy. If you need more room, you can fold the rear seats easily. The boot is super easy to open too – you just need to wave your foot near the bumper. Rear space is even better. In fact, it’s class-leading. You get an extra 15mm legroom over its predecessor, as well as 24mm extra knee room. You also get 27mm extra headroom. Everyone should be comfortable, and they should have plenty of room to stretch out. Standard kit across the range is good, with even the entry-level model getting the likes of 17” alloys, a leather steering wheel, and the aforementioned 8” infotainment touchscreen. They also come with Bluetooth connectivity, sat-nav, keyless start, cruise control, and climate control. The R-Sport model throws in 18” alloys, supportive sports seats, and sports suspension. The Portfolio trim, meanwhile, adds 10-way power adjustable front seats and more leather trim. It also comes with keyless entry and a reverse parking camera. 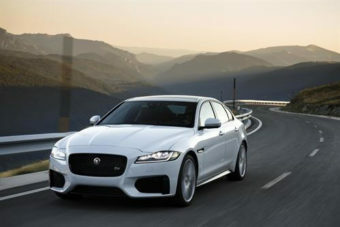 The XF S model tops the range with 19” alloys, a body kit and sports suspension. You can also upgrade to a 3.0-litre petrol engine. Perhaps surprisingly for such an edgy exec saloon, the XF passed its Euro NCAP crash test with five stars. It scored especially well for child occupant and adult occupant protection. Pedestrian safety is better than average, largely because of a clever pedestrian-sensing system. Safety assist systems, meanwhile, were also given the thumbs up. Prices for the new car start out from £32,500 and rise to £51,000. For more information on our lease deals, check out our page here. In terms of its running costs, the XF fares surprisingly well. They have to be, as exec cars are getting more and more efficient. The cheapest model is the 2.0-litre 161bhp diesel which returns 70.6mpg. This is incredible for such a big exec saloon. Even the bigger 178bhp version of the 2.0-litre diesel is good for returns of a 65.7mpg economy. Specifying four-wheel-drive and an automatic transmission will knock those figures down to 57.7mpg. The 3.0-litre petrol and diesel engines are unsurprisingly more expensive to run. The petrol returns 34mpg, and the diesel is good for 51.4mpg. It’s as handsome as exec saloon’s come. Suave and debonair, it’s a modern Jaguar that’s shaken off the brand’s pretentious, old-hat image. Rear legroom was poor last time. It’s now much improved. We don’t just mean its economy is reasonable. We mean it’s super cheap to run if you go for the entry-level diesel. How do returns of 70mpg sound? This is a surprise. But for all the interior quality, there are a couple of low-rent materials here and there. The entry-level diesel is affordable – but it’s also noisy. Let’s see how the car fares against its rivals in the comparison section of our 2017 Jaguar XF Saloon review. The new Audi A6 Saloon boasts a top quality interior, a range of affordable engines, and is as reliable as big exec saloons come. It’s a slick, tried and tested car that’s a veteran of this sector. But while it’s most definitely capable, it no longer excites on the road. The suspension does a great job at absorbing lumps and bumps, and the steering is light and easygoing. 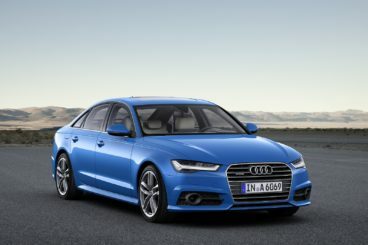 Quattro four-wheel-drive can be specified for more grip, and the A6 is an excellent tower. But none of this inspires you. In terms of the engines, the Ultra diesel is super efficient and can do 0-62 in 8.1 seconds. Its small wheels also mean that ride quality is good. It will be a popular engine, but if you want a bit more excitement the 3.0-litre diesel is a good bet. It can get you from rest to 62mph in 5.0 seconds, before maxing out at 155mph. Without a petrol engine in the ranks, these are your sole choices. Not much to pick from, but you do get to choose out of three transmissions. They include a 6-speed manual, a relaxed 7-speed S-Tronic, and an 8-speed TipTronic. The lack of a petrol engine means the economy is good. The 2.0-litre Ultra diesel is the cheapest to run, and can return 67.3mpg economy while costing £140 a year to tax. Those are good figures, especially when you consider how big the car is. The 3.0-litre diesel, meanwhile, is available in three power guises. It returns 64.2mpg at best, and 47.1mpg at worst. Inside, the Audi is – as always – a pleasant place to be. Our only criticism is the MMI scroll wheel, which can get really frustrating. Apart from that, the driver’s seat and steering wheel offer lots of adjustment, each seat is comfortable, and soft-touch surfaces abound. The controls are logically arranged, with the MMI control system taking care of most of the functions. Leather interior is standard across the range, as is sat nav, four-zone climate control, and a pretty awesome stereo. It’s a practical car, too. The boot measures 530-litres, and can be extended to 995 by folding the rear seats. Head and legroom are excellent, and the large windows ensure good visibility and a sense of airiness. 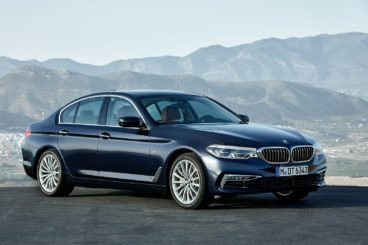 The new BMW 5 Series Saloon is a stellar exec saloon. It’s the best to drive in this class, houses a gorgeous interior, and can even boast improved economy. On the road is where this car excels. “The ultimate driving machine” moniker might be gone, but there’s no doubting who’s still King of the Road. Whether you want to cruise on the motorway or chase thrills on country lanes, the 5 Series Saloon can do it all. And it does it with barely a whisper. There are plenty of engines to choose from, including a new entry level unit. It’s a 2.0-litre diesel that develops 187bhp and powers the 520d model. It does 0-62 in 7.5 seconds, which will suffice for most buyers. However, let’s consider the 525d too, which is the same size. It delivers 228bhp, and can get you from rest to 62mph in 6.6 seconds. A bigger 3.0-litre engine powers the 350d xDrive, and does 0-62 in an almost ridiculous 5.4 seconds. That’s ferocious, and it feels every bit as thrilling as it sounds. The petrol engines follow a similar evolution, from sensible to sublime to unnecessary. The entry-level 520i model does 0-62 in 7.8 seconds, while the 540i roars its way from a standstill to 62mph in 4.8 seconds. Despite all that power, it’s super hushed. It isn’t, however, super affordable to run and is very much a luxury car. It returns 39.2mpg, and emits 164g/km of CO2. That’s not totally woeful, but at the other end of the scale is the 520d. It returns 68.8mpg economy, and emits just 108g/km of CO2. All other models sit between the two. It’s worth mentioning how beautiful this car is. Fearless on the road as a lion, it’s achingly gorgeous inside. BMW, as ever, have kept up with the times, so there is nothing dated in the cabin. Their iDrive system is still the best of its type, and the upmarket dashboard is as trendy as dashboard’s get. A 10.25” touchscreen is clear as day, easy to read, and easy to use. It comes with a slick rotary controller, too, as well as a cutting-edge touch sensitive top. All seats are impressively comfortable, although larger alloys will rock the boat. In terms of how practical it is, the BMW is competitive. Interior room is roughly the same as the XJ, give or take, and the boot measures 530-litres, which is par for the course. Wheel arches are a bit intrusive, but the loading lip is lower than last time. Disappointingly, the rear seats don’t fold unless you pay an extra £335. Moreover, there is no opening ski hatch unless you’ve got another £75 to spare. Still, head, elbow and legroom are all excellent, and all passengers should be comfortable enough. Ah, Jaguar. The brand seemed doomed a few years back, but it’s now more relevant than ever. 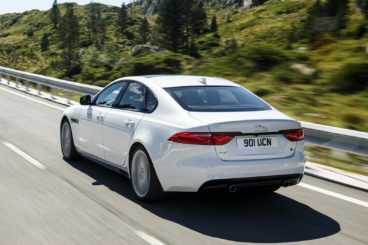 The XF has cast aside Jaguar’s dated image, taking cues from the excellent XE to be a serious contender in the executive saloon class. 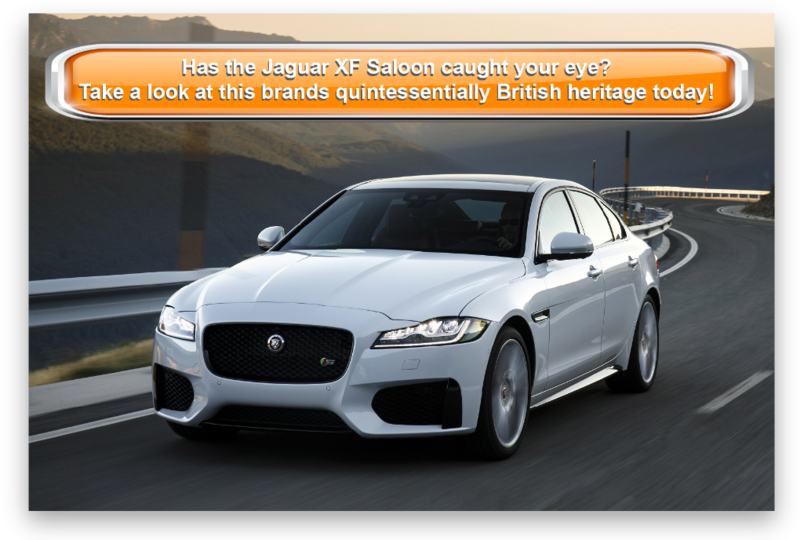 If sophisticated styling, low running costs, competent handling, and strong engines are your thing, the Jaguar XF Saloon is well worth adding to your shortlist.